Help teach a merchant to mind his own business. Plant Madesi's Silver Ring or drop Madesi's Ring and speak to Brynjolf. When you come across a merchant named Brynjolf at the Riften bazaar during the day or in The Bee and Barb at night, he will propose that you frame a vendor by planting a stolen ring on his person. The intended victim, Brand-Shei, has apparently become aware that someone is doing something wrong, and that someone wants him in jail, from where he can't interfere. If you accept, Brynjolf will tell you that he will create a distraction in the bazaar. While this draws people's attention, you are to steal a ring from Madesi. Madesi keeps the ring in a strongbox inside the cabinet under the counter of his stall, both of which are locked. You can unlock the cabinet and strongbox at night for an easier theft. Then, wait until after 4pm to actually steal the ring. Note that the ring you must steal will specifically say "Madesi's Silver Ring," rather than just any silver ring. After stealing the ring, sneak up to Brand-Shei and position yourself behind the crates he is sitting on. Pickpocket him and place the ring in his inventory. If you wish to spare Brand-Shei, you can drop the ring instead and tell Brynjolf you lost it. He won't be very happy, but you will be able to proceed to the next quest nonetheless. This quest can also be completed without stealing and pickpocketing by simply waiting while Brynjolf distracts the crowd. If you do attempt the theft and are caught by a wandering guard, you will be arrested. In either case, you will still be able to progress to the next quest. Speak to Brynjolf to receive a reward of 100 septims and a chance to join the Thieves Guild. After this quest is completed successfully, you may find Brand-Shei in the castle dungeon. You can talk to him and receive his identity quest from there if you did not receive it before. As soon as Brynjolf informs you of his plan you will receive a hidden perk increasing your pickpocketing chances by 30%, which makes planting the ring significantly easier. The perk will be removed once the quest is complete. No matter what you do, Brynjolf will still approach you, meaning that if you do not intend to do the Thieves Guild, the quest will always be in your journal. Leaving Riften during this quest could prevent the quest from progressing. Brand-Shei becomes imprisoned in Riften Jail forever, instead of just for a week. Fixed by entering the following in the console: set TG00BrandSheiJail to 0. The next time Brand-Shei's schedule is updated, he will leave jail and resume his original schedule. Force him to update his schedule right away by selecting him in the console (or entering prid 19DDC) and then entering evp. 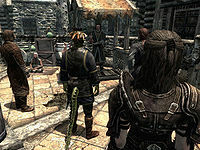 If you enter Riften via the Meadery and speak to Maul after speaking to Brynjolf, the miscellaneous quest "Talk to Brynjolf about joining the Thieves Guild" may become stuck in your quest list. In the console, enter setstage TG00MaulHandler 200 to remove the entry. 200 Finishes quest Brynjolf's scheme in Riften has ended and the promise of more coin has been made. This appears to be the beginning of profitable friendship. Esta página foi modificada pela última vez à(s) 18h46min de 20 de agosto de 2015.